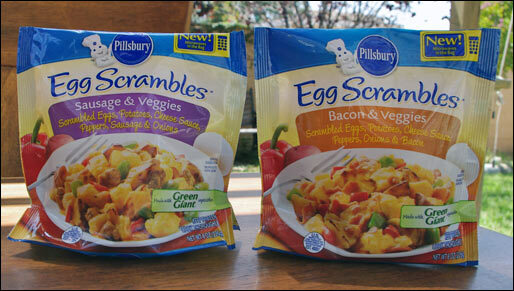 I tried two varieties of Egg Scrambles: Sausage & Veggies and Bacon & Veggies. These products won me over. They taste skillet-fresh and they avoid all of the pitfalls of similar microwave product. Many "scrambles" in the grocery store freezer section suffer from an artificial egg texture. The eggs here were fluffy and flavorful. Another complaint about similar products is residual liquid left over from the microwaving process. No matter how good a dish might be, it losses it's appeal if you have to spoon through pools of water to eat it. Fortunately, the "microwave in the bag" method of this product eliminates that problem. The end product is moist without any residually liquid. Of the two varieties, I preferred the one with sausage. The meat was flavorful. The Green Giant vegetable tasted fresh and the cheese (sauce) was plentiful. The bacon in the other variety tasted like good bacon, but it was slightly chewy compared to its homemade equivalent. 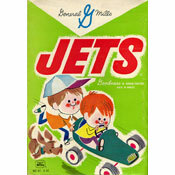 Nutritionally, these these products make no claims to be diet-friendly. But, they are a decent choice when compared to certain 1,000 calorie scrambles from restaurants like Denny's. 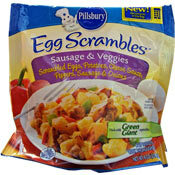 All in all, I highly recommend Pillsbury Egg Scrambles. Microwave breakfast products are getting better with each passing year. This is a nice example of how these dishes have improved in recent time. The SAUSAGE & VEGGIE variety has 280 calories per single serving bag with 16 grams total fat (5 grams saturated and 0 trans), 315 mg cholesterol, 880 mg sodium, 21 grams total carbs, 3 grams dietary fiber, 5 grams sugar and 14 grams protein. The BACON & VEGGIE variety has 290 calories per single serving bag with 15 grams total fat (4.5 grams saturated and 0 trans), 310 mg cholesterol, 1,100 mg sodium, 22 grams total carbs, 3 grams dietary fiber, 5 grams sugar and 17 grams protein. 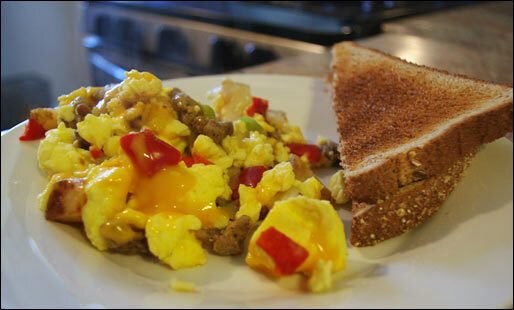 What do you think of Egg Scrambles? The sausage and veggies one is great. Haven't tried the bacon variety yet. I bought the sausage and veggie from Target since they had it on sale. I was concerned there would be too much cheese and it would turn the dish to mush. The directions are ridiculously easy and the portion size would cover a typical dinner plate (cover it not be a pile on top of it). I thought the sausage was pretty good and the veggies had their distinct taste. The eggs came out good for being frozen but they weren't runny or mushy. The cheese sauce is drizzled a couple of times over the food before it is frozen so that made me happy as it provided a little taste and not overwhelm the dish. The dish tasted as expected and it wasn't a salty mess like most frozen meals. My only complaint was that the veggies seemed to be softer than the eggs. They didn't taste bad but I just found it strange. It's a pretty good product overall. I haven't seen the bacon & veggie version anywhere though. Is the cheese sauce separated in its own bag which gives you the option whether you want to use it? This sounds good but I don't like cheese on eggs.